Sushi began as a method of preserving fish centuries ago and has evolved into an artful, unique dining experience. In its earliest form, dried fish was placed between two pieces of vinegared rice as a way of making it last. Later, the nori (seaweed) was added as a way to prevent people’s fingers from getting sticky. 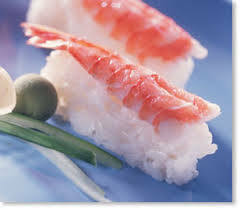 Technically, the word ‘sushi’ refers to the rice, but colloquially, the term is used to describe a finger-size piece of raw fish or shellfish on a bed of vinegared rice or simply the consumption or raw fish in the Japanese style. This can be eaten as is, or is often dipped into shoyu (Japanese soy sauce) and then eaten. Great care is taken in the creation of the dish and the many methods of preparing the food indicate the importance of appearance to the educated consumer. It is light, delicate, and low in calories, cholesterol, fat and sodium. It’s balanced in nutrition and tastes delicious. Sushi is a work of art as much as a food, and while it is now available in a western ‘quick and easy’ serving style, the traditional ways are far from lost. The little fingers of rice topped with wasabi and a fillet of raw or cooked fish or shellfish. Generally the most common form of sushi you will see. Also called a hand-roll. Cones of sushi rice, fish and vegetables wrapped in seaweed. It is very similar to maki. Usually a bowl or box of sushi rice topped with a variety of sashimi (sliced raw fish). A simple and inexpensive type of sushi, in which sushi rice is filled into aburaage (deep fried tofu) bags. Oshizushi is pressed sushi, in which the fish is pressed onto the sushi rice in a wooden box. Why do the Japanese people enjoy good health far into old age? Experts agree that their traditional diet may be a key factor. And sushi is the most famous part of that diet. Sushi is the latest trend in healthy foods for busy Americans. Sushi (and seafood in general) may be one of the best sources of nutrition available to us. Packed with protein, dense with nutrients, and often low in fat, sushi is an excellent way to enjoy a meal regardless of one’s dietary lifestyle choice. Sushi is an excellent source of lean protein and contains very little heart clogging saturated fat, unlike meat from terrestrial animals, and what fat is available is mostly in the form of Omega-3 fatty acids. Omega-3 fatty acids are not only a nutritional requirement for humans, but also a fat that shows promise in remediating many ailments from which we suffer for lack of this essential fatty acid in our modern diet, including cardiovascular disease. 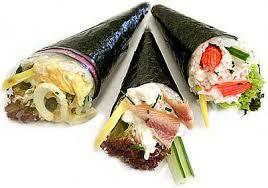 The seaweed wrap used in rolls (maki),called nori, is rich with essential vitamins and minerals. Wasabi (a fiery-hot, greenish paste made from an exotic grated root) and ginger both have antibacterial qualities, and ginger is widely regarded as aiding digestion and improving circulation. For those who have concerns about raw food, not all sushi is made with raw fish. In fact, the majority of sushi products are made with cooked seafood or fresh vegetable — for example, California rolls and Vegetarian Sushi. In fact, only salmon and tuna are usually served raw. As with any raw food there is some degree of risk of food borne pathogens, but with seafood the most important topic is contaminants. If You´re wondering if “is sushi good for you”, the answer is a resounding ‘yes’, however anyone eating fish, especially raw should be aware of the potential health concerns. The recent talk is the contaminant such as heavy metals that can be present in some fish, especially the larger predatory fish such as tuna and swordfish. Essentially, the higher up the food chain a fish is, the the more contaminants concentrate. While studies swing wildly one way or another, there clearly is some degree of heavy metal content in the larger predatory fish, but the health questions to focus on are to what degree and how much is bad for you. Aside from contaminants, raw seafood can also be the vector for various pathogens, viral, bacterial, as well as larger parasitic creatures. Proper sanitary conditions must always be met or any raw food could possibly make one sick. Fortunately, recent studies concluded that the benefits of eating seafood far outweigh the potential risks. As with many foods, eating sushi does in fact carry with it some small risk of pollution related contaminants being consumed, however in moderation, it is a perfectly safe food. But that said, please do remember that there can be other risks. Sushi is as safe as any other food as long as proper handling conditions are met. While certain individuals should take steps to minimize particular risks due to their current condition, for most of us, sushi is as safe as it is good for us. That said, it is wise to make sensible decisions as to where you will be eating sushi, and if an establishment looks as though it may not be taking the proper precautions, it is best avoided. Be smart and you should have no problems finding an enjoyable and delicious sushi meal.